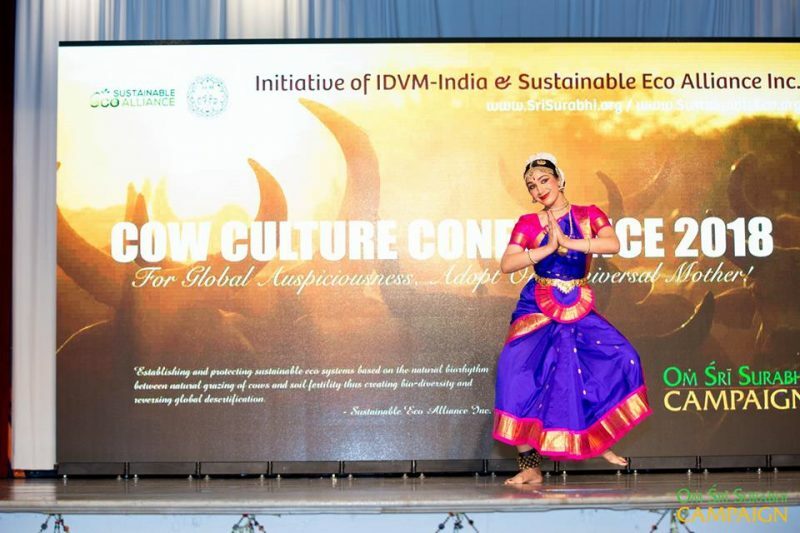 On Sunday, May 20, 2018, a conference on Cow Culture was held at the India Community Center, Milpitas, California, which is located on the Northeastern side of the area that has become known as Silicon Valley. The conference was organized by the Om Sri Surabhi Campaign (California). The campaign was launched by ISKCON India Minister for Daiva Varnashram, His Holiness Bhakti Raghava Swami during January 2015. His disciple Sri Krishna Purushottam Das was inspired by Swamiji to organize this conference. Well known Indian social activist and member of the upper house of India’s Parliament (the Rajya Sabha), former Indian Minister for Commerce, Law, Dr. Subramanian Swamy (also ex-Professor of Commerce, Harvard University) was the Keynote Speaker at the conference. 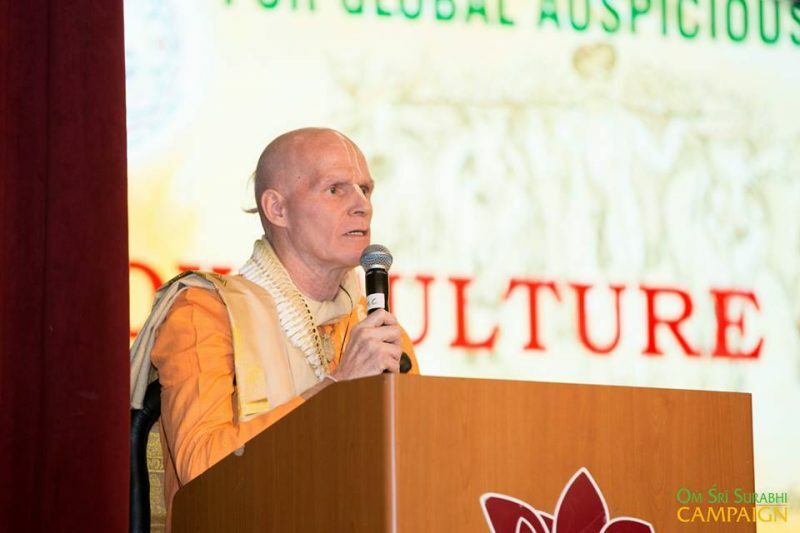 ISKCON GBC member His Holiness Bhakti Charu Swami was Chief Guest at the conference. Before the inauguration of the conference, the auspicious “go puja” (traditional worship of the cow) was performed outside the conference hall. Locally based scholar (pandit) of the Sri Vaishnava sect, Sri Venkatesh Iyengar Swami [of “Jet” California] performed the puja with mantras from the vedas, offering of lamps, and other items of worship. ISKCON devotees performed kirtan during the puja. 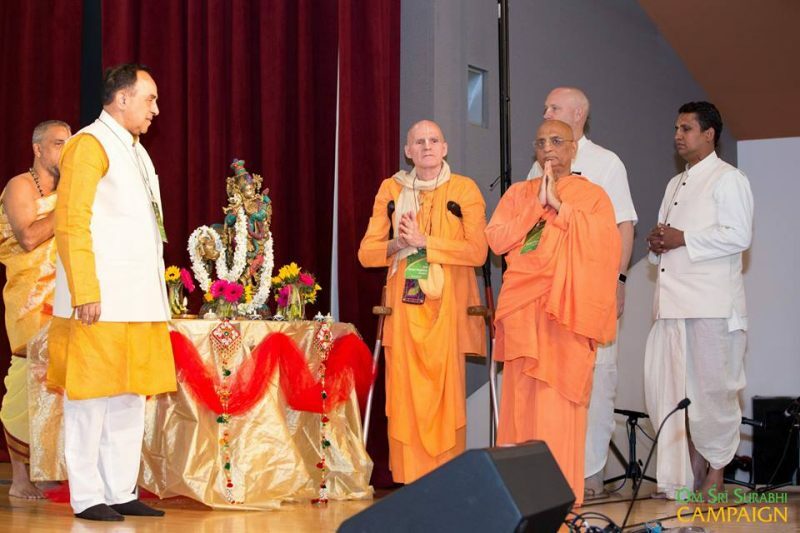 Thereafter the conference inside the ICC hall was inaugurated by the lighting of the traditional lamp by Dr. Subramanian Swamy, Bhakti Charu Swami, Bhakti Raghava Swami, and local ISKCON of Silicon Valley Temple President, Vaisheshika Das. Vaisheshika Das welcomed the assembled public and the distingushed guests in his inaugural address. 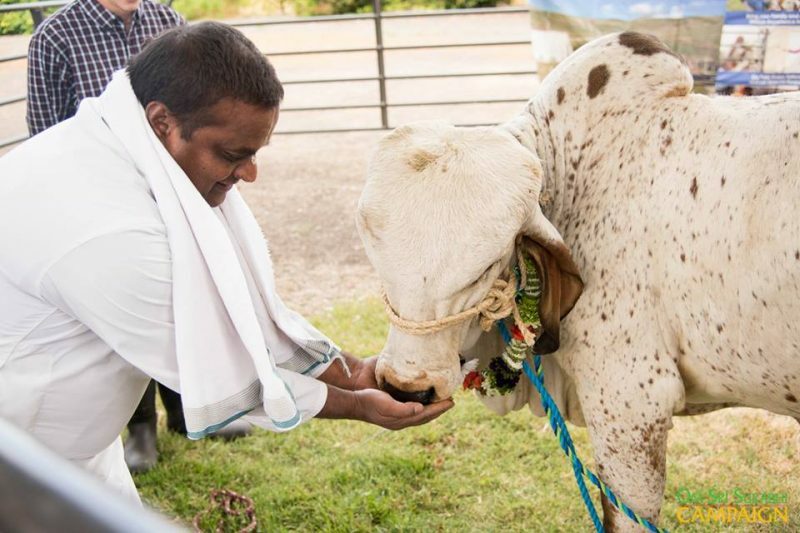 He pointed out in his speech how cows are integral to spiritual life. He expressed happiness that the conference was orgainzed in the Silicon Valley area. After his inaugural speech, a video was shown introducing the Sri Surabhi Campaign. Bhakti Raghava Swami then spoke on the Sri Surabhi Campaign and the importance of cows and their relationship with human society. He stressed the protection of cows as an intricate part of sanatan dharma and varnashram dharma. He pointed out the necessity the importance of establishing farm communities where life is centered around agrarian activities, cow protection as per the teachings of Lord Krishna in Bhagavad-gita. Bhakti Charu Swami appreciated the efforts and sincerity of Bhakti Raghava Swami, whom he said he has known since his own early days in ISKCON at Mayapur. He noted his determination and commitment was key to developing the Nam Hatta in West Bengal, and that Maharaj was continuing the same at present regarding cow protection and the development of rural Krishna concsious communities. He explained the importance of cow milk for human society and in day to day life. Sri Ajay Shingal, President of the local Hindu Seva Sangh, welcomed the gathering and pointed out his own commitment to establish a cow sanctuary in the Silicon Valley area. Before his keynote speech, Dr. Subramanian Swamy launched both the Om Sri Surabhi mobile App for IOS, [that is now available for download on the Apple App Store] and released the new book written by Bhakti Raghava Swami, entitled “Modernity is killing Civilization”. During his keynote speech, Dr. Subramanian Swamy explained the importance of the social economics of cow protection by pointing out that cows and cow products are an integral part of the economy, of medicines, building materials and fertilizers. He said he is committed to seeing that the Indian Parliament adopt a cow protection bill that is to come up for approval this upcoming July 2018. He expressed appreciation for the efforts of ISKCON in the area of propagating cow protection and in encouraging and facilitating rural development. Also a number of ISKCON devotees made presentations at the conference during the afternoon session. Balabhadra Das of ISCOWP, Damodar Dulal Das, ISKCON India Minister for Cow Protection, Daiva Das who is developing a rural community in Hawaii, Sri Rama Das, President of ISKCON Mangalore, Parag Shah, and Dr. Balganesh, Oncologist,. In the middle of the presentations there was a kirtan led by Uttama Bhakta Das and his group, and a Bharat Natyam dance performance by Shreya Iyer. Before the conclusion of the conference, there was a question and answer session with Dr. Swamy, Sri Iyer, Jagadish Shetty, Balabhadra Das, Basu Ghosh Das, and Sri Krishna Purushottam Das. 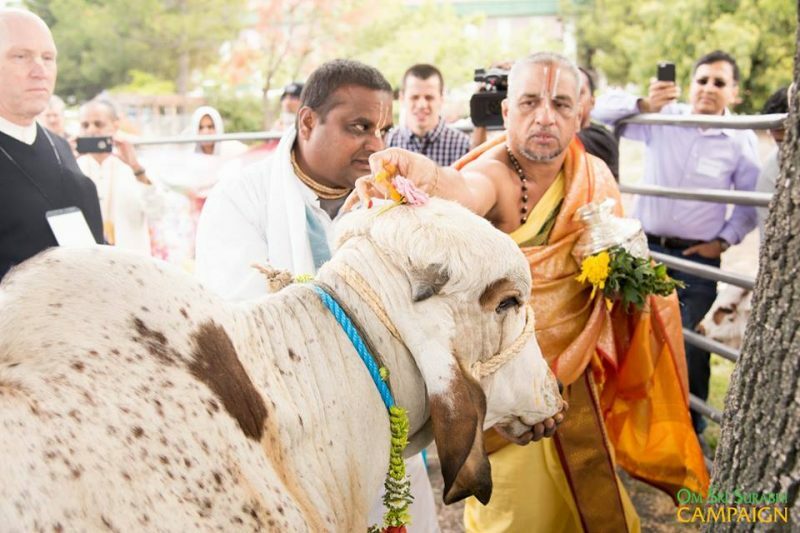 Dr. Swamy proposed a Mega Cow Culture Conference to be organizezd in coordiation with ISKCON and other spiritual organizations to be held at New Delhi after the upcoming parliamentary elections in 2019. He said that he would make sure Indian Prime Minister Narendra Modi would inaugurate that conference. A vote of thanks to all was presented by Sri Krishna Purushottam Das, continential coordinator of the Om Sri Surabhi Campaign. He expressed special appreciation for the disciples of ISKCON Founder-Acharya Srila A.C. Bhaktivedanta Swami Prabhupada, i.e. Bhakti Charu Swami, Bhakti Raghava Swami, Vaisheshika Das, Balakrishna Das, Daiva Das, Balabhadra Das, Basu Ghosh Das, Rabindranath Das, Nrsimhananda Das, Nirukula Devi Dasi, Jagarini Devi Dasi, Akruranth Das, Udayananda Das and Lakshman Das. Balimaradan Das was the MC of the event.